Learn How to Manage Pain with Hypnosis! Pain is a symptom of something wrong in body and/or mind. If the primary cause of the pain is physical, my Pain Management Hypnosis MP3 can be used to induce analgesia or anesthesia in the painful area. The residual discomfort reminds the you that there is a physical condition which needs to be or is being treated and warns you not to over do. A football player may have and injured knee which causes intolerable pain. If it is eliminated with steroids, he can play as if there is nothing wrong and without medical intervention damage the knee irreparably. The same risk is involved in eliminating the pain hypnotically. Pain may result from a number of non-medical or non-physical causes. Sometimes a person feeling the weight of intolerable guilt from a real or imagined experience will inflict pain on oneself to get rid of the guilt or avoid punishment from a higher authority. In this situation the objective of my Pain Management Hypnosis MP3 session is to help you forgive yourself and to internalize the release from real or imagined mistakes. Once you truly experience the forgiveness and release, supportive suggestions can be made which help the you with new subconscious understanding. 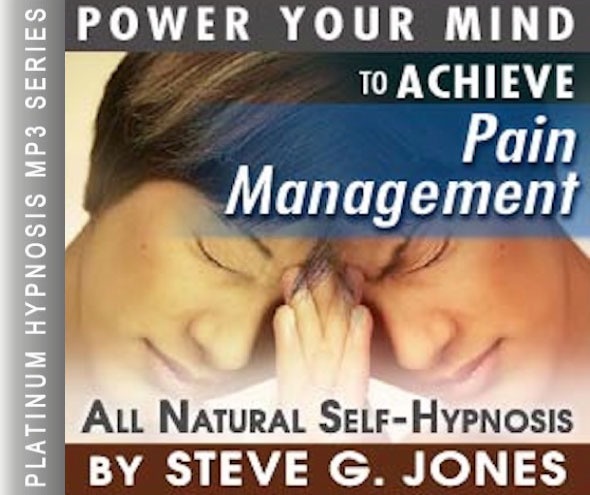 This pain management hypnosis MP3 is all that is needed for effective relearning. Steve G. Jones, Ed.D., Clinical Hypnotherapist, charges $1,500 for a custom recording and $25,000 for a one-hour private hypnotherapy session at his office. but you can get all the benefits for this low price. Simply listen to the mp3 every night as you go to bed for three weeks and feel the changes happening in your life. You will feel more empowered, more in touch with your true self, and you will truly know that your goals are within your reach. When in pain it is pertinent that you see your doctor. They can diagnose the cause of your pain and will discuss with you the best form of treatment. If you are interested in hypnosis, I suggest you discuss it with your doctor. Over the years I have had patients come to me in chronic pain and traditional medications were not helping them. They often told me that hypnosis was a last resort for them. Many studies have been performed on the role hypnosis plays in reducing pain and there has been a lot of positive feedback from the medical community. As a hypnotherapist, I have seen the positive effects hypnosis has on my clients. Through hypnosis they have learned how to control their pain. If you are in chronic pain or you know someone who is. I encourage you to explore hypnotherapy as a possibility to control pain. I always encourage you to seek advice from your doctor first, but hypnosis is natural and very helpful to many people. Hypnosis teaches people techniques to control their pain wherever and whenever they may be feeling the pain. And as you continue to relax, I would like you now to imagine yourself walking into a room. This is a room in your mind. This is the control room. This room controls all of the sensations your body feels. And directly in front of you is a circuit breaker box and you slowly walk up to the circuit breaker box and you open this box. It is a circuit breaker box just like you would find in a home. Notice there are many switches in this box. There is a switch for your head. There is a switch for your left arm, your right arm, for your torso which runs from your neck all the way down to your waist. There is a switch for your left leg which runs from your waist, all the way down your left leg, all the way to the bottom of your left foot. There is a switch to your right leg which runs all the way from your waist, down, down, down your right leg, all the way to the bottom of your right foot. And you realize now that you are fully in charge of all of the sensations in your body and notice that you can turn off the sensation to any part of your body, any time that you choose, simply by entering this control room in your mind. So now I would like you to practice using the controls, using the circuit breaker switches. I would like you now to turn off the switch to your left arm, and as you do notice that the sensations in your left arm disappear. Notice that you are without feeling in your left arm and as you now turn it back on, notice that these feelings come back. And day by day as you practice this, you will get better and better at this procedure. I would like you now to turn off the circuit breaker switch which controls your right leg. Notice as you do that the sensations in your right leg disappear. And now you may turn that circuit breaker switch back on and notice that the sensations in your right leg reappear and now I would like you to take a moment as I talk and turn on and off various switches. And as you do, notice that the sensations in that corresponding part of your body can appear and disappear. You can feel them when the switch is on and not feel them when the switch is off. And you are so very relaxed. And as you practice, you realize that you get better and better at this procedure and you will find that you practice this procedure even while you are fully conscious so that you may develop your skills. And very soon indeed you will be fully in charge of all the sensations in your body. Able to turn them on or off at your discretion. So relax now and realize just how powerful you are. Numerous studies have been performed on the benefits of self-hypnosis in relation to pain management. The overwhelming conclusion has been that you can greatly influence the severity of your pain by learning and practicing self-hypnosis. With this pain management recording, you do not have to do any of the learning about hypnosis. You can just lay down and let Steve G. Jones do the work. Steve has worked with hundreds of pain patients. Regardless of what is causing their pain, he has been able to help them control their pain. Your subconscious mind controls your pain and you can learn to be in control of your subconscious mind with hypnotherapy. Hypnosis will put you back into control. 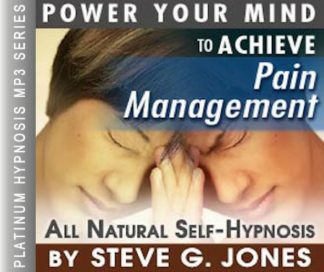 We suggest you listen to this Pain Management Hypnosis MP3 recording for 21 nights before going to bed. The powerful affirmations will start re-programming your subconscious mind right away. You may see results right away, or it may take some time, but we promise you will be amazed at how hypnotherapy can put you in control of your pain! A study conducted in a hospital in Switzerland showed that hypnosis is an effective treatment of pain management. The study analyzed 40 ICU burn patients whose pain was measured using the Visual Analog Scale (VAS). These patients were also using prescribed opioid medications. Doctors were able gradually decrease the dose of these medications in the patients who proceeded with hypnotherapy sessions as they reported less pain than the control patients who did not use hypnotherapy. This study also found that the patients who proceeded with hypnotherapy experienced reduced anxiety, needed fewer skin grafts, and had overall lower hospital costs (Berger, M. M., et al, 2010). Berger, M. M., Davadant, M., Marin, C., Wasserfallen, J. B., Pinget, C., Maravic, P., … & Chiolero, R. L. (2010). Impact of a pain protocol including hypnosis in major burns. Burns, 36(5), 639-646. A study by Daniel P. Kohen in the International Journal of Clinical and Experimental Hypnosis showed that self-hypnosis is an effective treatment for recurring headaches. In addition, this study showed that pain-relieving benefits of self-hypnosis lasted for many years after subjects received self-hypnosis training. Subjects of this study also reported that self-hypnosis improved other areas of their lives, including stress reduction and a general positive attitude (Kohen, 2010). Kohen, D. P. (2010). Long-term follow-up of self-hypnosis training for recurrent headaches: what the children say. Intl. Journal of Clinical and Experimental Hypnosis, 58(4), 417-432.